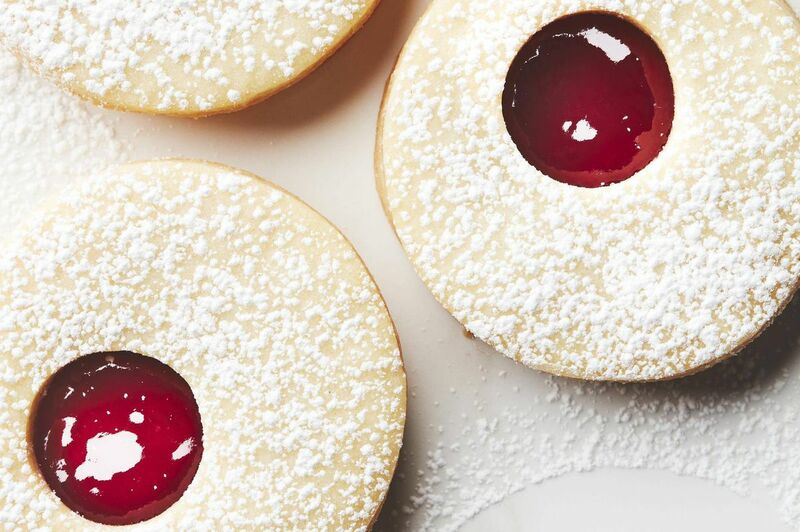 Regardless of how you dress it up, sugar cookie dough can be rolled and cut into shapes, sandwiched with raspberry or apricot jam (even Nutella), or shaped into a log, wrapped in parchment and refrigerated or frozen to slice and bake in cookie emergencies. In a large bowl, beat butter and sugar for 2-3 minutes, until pale and light. Beat in the egg and vanilla. Add the flour and salt and beat on low speed just until you have a soft dough. Divide the dough in half, shape each into a disc, wrap in plastic and let rest or refrigerate for at least an hour, or for up to a few days. When ready to bake, preheat the oven to 325 F. On a lightly floured surface, roll each piece of dough out to about 1/4-inch thick. Cut into 2 1/2-inch rounds with a cookie cutter or glass rim and cut smaller circles out of half (or use a different small shaped cookie cutter ). Transfer to a parchment-lined sheet and bake for 10 minutes, or until pale golden around the edges and set. Transfer to a wire rack to cool. Spread solid cookies with jam. Place the cut-out cookies on a baking sheet and sprinkle with icing sugar, then place on top of the jam-topped cookies. Store in a covered container for up to a week. - Add chopped chocolate, chopped nuts and/or dried fruit, roll the dough into two logs, wrap in parchment and refrigerate. Slice and bake as needed. - Add 1/2 teaspoon ground cardamom to the dough, or 1 teaspoon cinnamon and 1/2 teaspoon nutmeg . Roll and cut into shapes. - Make thumbprints by placing walnut-sized balls of dough on a baking sheet, indent each with your thumb and fill with jam or mincemeat before baking.